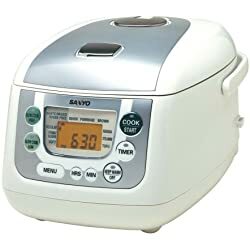 Ratings & descriptions of some Sanyo 5 cup rice cooker models that are worth purchasing. Each model uses Fuzzy Logic technology (except for the Sanyo ECJ-N55W) and produces great tasting above standard quality rice. One of the most versatile Sanyo 5 cup rice cookers to consider is this great model. As we mention on our original review page, this unit offers the user a wide array of features and benefits that make this an all around small cooking appliance…and not just a rice cooker. For making rice, the ECJ-HC55S has several settings to select from including white rice, brown rice, sushi, mixed, and sprouted brown. In addition, folks are given a neat little texture setting for when making white rice; soft, hard, or regular. As for the other onboard settings, there is a high and low slow cooking setting with a maximum cook time of 12 hours, and a food steaming setting. The cooker comes with a separate bowl for when slow cooking stews and soups, along with a steaming tray for preparing healthy steamed vegetables, poultry, seafood, and eggs. Other key features are a keep warm mode, retractable cord, condensation collector, stay cool carrying handle, and non-stick extra thick bowl ideal for consistent evenly-cooked rice. The unit is moderately priced and should fit most budgets. Another neat multi-tasking Sanyo rice cooker to consider is this basic 5.5 cup model. This unit should appeal to most folks who like to have regular white rice with dinner on occasion along with steamed vegetables and wish to leave the stove pot under the cabinet. However, for those who prefer to have brown rice more than white rice, then this particular unit should be skipped since it does not have a setting for brown. Aside from preparing white rice, there is also a setting for making soups or porridge on this Sanyo 5 cup rice cooker. We also like the fact that this cooker comes with a steaming tray for making healthy steamed food while the rice is cooking above. All folks need to do is push a lever to the side when wanting rice, soup, or porridge. However, please note that this cooker does not use Fuzzy Logic technology and there will be some slight rice crusting at the bottom. But from what we researched, this will not ruin the entire batch and is similar to the way it will crust when cooking on a stove top. Overall, it is a good buy, is easy to use and clean, will not boil over, and has a nice modern look and feel that should fit the decor of any kitchen. It is not too large either. This Sanyo 5 cup rice cooker is very similar to the first above model although there are some differences. This unit uses VPC technology (Variable Pressure Cooking) along with Fuzzy Logic to rapidly move the rice resulting in evenly-cooked great textured rice batches. The rice settings aboard this unit are, white rice, brown rice, sprouted brown, mixed, sushi, and sweet rice. Like the ECJ-HC55S, this cooker also has a white rice texture setting as well. Also offered on this unit is an 8 hour slow cooking setting, and a food steaming setting. It has a great keep warm mode, convenient retractable cord, stay cool carrying handles, and will not boil over or crust the bottom layer of rice like cheaper units. This cooker is both easy to use and clean. Update (9/19/10): This unit may be unavailable and/or discontinued…we will update as new information becomes available. Currently, these are the only Sanyo 5 cup rice cooker models on the market. For researching other brands, please see the “Best 5 Cup Rice Cookers” tab on the above Navbar.